What is the best 8 inch subwoofer of 2018? What, dissapointed? Too expensive? You don't like JL? We're going to review the top 5 choices on this size with a side-by-side comparison to help you find the perfect sub for your needs and budget. Dual Voice Coils give more wiring options. Better sound quality than most 8 inch subs. Quality of build and materials is great. Our selection covers some high SQL subwoofers, great competition-grade subs for high SP﻿﻿L and the best of the budget friendly subs on the market. Only good stuff, because you deserve that. This is in our opinion the best 8 inch subwoofer money can buy. Quality is always guaranteed when we speak about JL audio, and the W7 line is just the best they produce. This is a special edition that includes the exclusive polished nickel surround ring and special boxing and labeling. As every other JL Audio, the quality of build is outstanding. JL incorporates their latest technologies on the W7 series, and this subwoofer is so damn well made that it really sounds like a 12". As always with JL, we're provided with a "optimum range" for RMS instead of a bold claim that is later not sustained as we've found in so many other brands. The official RMS is 500Watts although they recommend to use an amplifier that works between 250w and 500w RMS for perfect performance. From our experience, you really want to feed this subwoofer with 500W as they give their best at that power level. Peak power is 1000w. With 82.7db SPL and the power this sub moves, we know it blasts loud without compromising the slightlest bit of Sound Quality. This is where this subwoofer clearly stands out of the crowd. It incorporates JL's W-Cone that increases rigidity of the cone, which ultimately will reduce distortion, giving you a clear, crisp sound all day long. Many JL subs are rated at 3 Ohms and that's somewhat weird, since it forces you somehow to go and pair it with their own amplifiers if you don't want to trouble yourself too much. Real value is somewhere around 2.78ohms with one single coil. There are a few "not so good" things that we want to say about this subwoofer. First and most obvious is the price. You pay what you get but for the money there are quite a lot of good 12 inch even 15 inch subs. Mounting this subwoofer isn't easy. You have to disconnect the surround from its mounting point on the basket which is rather unconventional. Then the cutout diameter...6.94 inches. If you do the box yourself, you may think "I'll cut just 7inches" just to discover that the bolts won't have enough material to get drilled on. To move this sub with the power it needs to excel, we recommend using ﻿﻿JL's X﻿﻿D600/1 which gives exactly 500W RMS @3ohms. We tried the sub with this amplifier with incredibly satisfying results. 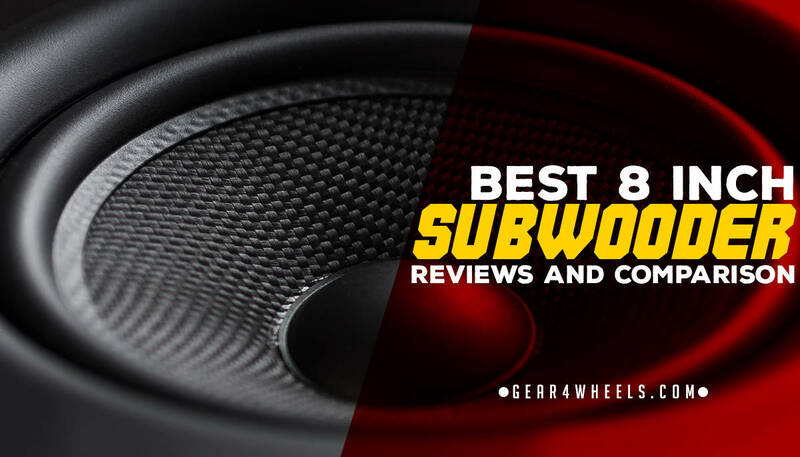 Sundown always gets a spot or two in our "Best of" subwoofer reviews simply because their products are amazing. Any basshead will tell you so. In the smallest subwoofer size, our favorite is the X-8, for its consistent, amazing high excursion and LOUD bass. Unlike other 8 inch subs, this one does really hit those very low notes, giving your audio system much deeper sound. With a sensitivity of 82.71 and a menacing 750W RMS, this is definitely a LOUD bass. It is designed towards SPL with a good Xmax of 16mm one-way by 70% BL. Sundown makes some other subs in this size however we've decided to include just their loudest. It doesn't compromise sound quality as other cheaper 8" subs designed for SPL do. This one sounds deep and clear. It really is a worthy choice as a competition subwoofer. Along the coil it incorporates stitched-on double high-power tinsel lead wires for superior resistance of the black aluminium 2.5" voice coil. The heat dissipation on this subwoofer is outstanding. This subwoofer is available in Dual 2ohm coils or Dual 4ohms. The one displayed is the 4 ohms one. It will allow you to wire it either 2ohms, 8 ohms or 4 ohms using 2 amps. The only downside we've found is that it bottoms out on the deepest frequencies (around 18hz) when pushed to the max. All in all a great subwoofer for which we can hardly find any weaknesses. When we tried this subwoofer (back in March), our friend had it hooked up to a Hifonics BRX1516.1D Brutus at around 1000w RMS and we were quite surprised with how well the Sundown was handling that wattage. We cannot give further advise for this subwoofer in particular as we have only tested it with that amplifier. Bottoming out on lowest freqs. Kicker's Solo Baric exclusive and exotic shape is the reason this subs hit SO hard. We've reviewed bigger sizes of this subwoofer before (#6 on our 15 inch subwoofer comparative) because we were very impressed the first time we heard this subs and have become quite familiar with them. This sub pumps a neat 83.6 db SPL. With official 450w RMS, we know the L7 to be really loud for a 8". We know they withstand more than that but don't recommend it. 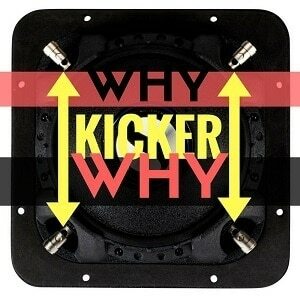 In all honesty, between buying a lesser quality 12" sub or this 8" Kicker, we would go for Kicker anytime. It isn't only loud but also the sound quality is perhaps the highest of the 5 sobwoofers we review on this article, with the exception of the W7 by JL. This is pure top-of-the-line technology here. This was the world's first patented square sub, with extra cone area that results in louder sound than round subwoofers of the same size. 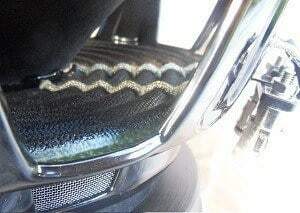 The patented corner-ribbed, double-stitched Santoprene surround helps holding the massive motor in place. The Solo-Baric's durability is way above average aswell as its excursion. The Sound Quality in this subwoofer is, as said, the best for this size. This subs come in either 2 or 4 ohms DVC (Dual Voice Coils). Now, why on hell would you, Kicker, place each terminal on a different corner of the subwoofer? We love when terminals are nice and conveniently placed together on the same side of the sub so wiring is as simple as possible and this isn't the case. I guess Kicker's originality had to be shown in more places. The issue isn't as dramatic as I feel it is. If you are wiring just 1 sub it is ok. But if you want to, lets say, wire 6? It just makes it unnecessarily complicated. All in all a great subwoofer that will be the delight of SPL lovers and Audiophiles alike. A hard, well made subwoofer that knocks some serious bass and reproduces music with outstanding fidelity. For the money, we think is the best option. For 4 ohms load we recommend hooking this sub to a JL Audio JX1000/1D as the amplifier is one of the best around for the price and power. At 4 ohms it gives 500W RMS stable and minimal distortion. The third generation of JL subwoofers is still today one of the best options available on the market. As in every other JL, we're provided with the Continuous RMS power aswell as an "ideal" or recommended power range. In this case, 250W RMS and anything inbetween 75 and 250W RMS. Peak power is 500W. With 83.24 dB of SPL, this little sub packs a punch. For the price is one of the smartest purchases you can do. If you've readed our review of JL's W7 (our winner) you know they take construction of this subwoofers quite seriously and that they incorporate a monstrous list of technologies. If you don't have a lot of space, this sub is perfect. For the money you get a super well-made subwoofer that blasts quite loud. Don't expect it to sound like a bigger sub (the W7 and the Sundown are far superior in this regard). The sound quality they produce is superb so this is definitely a great choice. Hard to find it any downsides besides the little power and not-as-loud bang when compared with the other subs on this list. We tested it on a JL ﻿﻿﻿Audio﻿﻿﻿ JX360/2 bridged at 4ohms. It was giving little under 280W RMS with which we were extremely satisfied with the output. Not as loud as the competition. Shallow Mount subwoofers are great subwoofers to get in the trunk without having to give up much trunk space. They don't blast as loud as regular subs and are tipically a bit more expensive but this one is an absolute steal. With 82 db SPL and just 150w RMS this isn't the loudest subwoofer ever made but will still provide with some loud, crisp bass. For those with insufficient space to fit a regular sized sub, this is a great choice. Rockford Fosgate cone formers and dust cap are made of anodized aluminium making this sub light and easy to drive, yet rigid enough to sustain its shape under high load. The M-Roll Santoprene™ surround also provides excellent excursion for maximum output while being durable enough to last. This subwoofer has dual coils with 2 ohms impedance each. The wiring setups are either 1ohm, 2+2ohms or 4 ohms. A great subwoofer for those with a small budget and not much space in their car to fit a bigger sub. Not as loud as the other subs listed. In this size, there are cheap subwoofers galore. 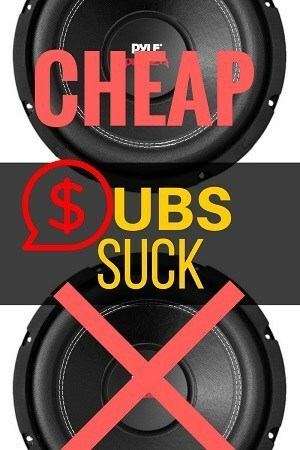 I've burnt some of those 25$ subs in less than 10 minutes and I'm tired of shop guys pushing some Boss or Pyle subs. However, if you have a bit more to invest in good quality equipment, keep reading, I have good things for you. I've done hundred hours of research and used years of experience to craft this list including ONLY the highest quality subs in a good range of prices so almost every budget will find a great sub. One of the best things of going for smaller sized subs is that they aren't usually that power hungry, meaning less stress for our c﻿﻿ar battery. This was our take for the best 8 inch subwoofer of 2018. Sad that this list doesn’t include the CDT Audio QES-820. That one is actually an 8″ sub rather than the 7″ stuff you’re featuring here. It can manage its entire range in a sealed enclosure as small as 0.2 cubic feet. It has unbelievable extension and sounds fantastic, with an RMS of 400w (800w peak). It has the flexibility of DVC. And the price is downright reasonable. I’ve got a couple of them hidden in my car where no-one can tell, and everyone’s always blown away by the sound quality of my audio system. Especially since no-one can tell it’s all custom gear. You can buy TWO of any of these for less than the price of one of those garbage JL woofers on top of the list. You should focus more on what’s going on in the real world of car audio and less on what’s going on at Circuit City… mainstream audio is dead. I’ve ran 8″ JL W7’s and W3’s. Plus I’ve personally owned and ran all but the Rockford shallow. I can attest to the accuracy of the ranking of this list. But I only use JL drivers today after being in the car audio game since the mid 1980’s. Thanks Jerry, appreciate it. I haven’t been as long in the game (just over a decade now) and had the same feeling in the beginning with brands like JL and Focal like “are you guys taking the p**s with your prices? ?” then you try and try brands… and everything makes sense hah.